From Lynne - And thanks to Tumbling Tom and the Big Band section for a very fine show and good calling - as usual! From Cathy - What a fab night! Thanks so much to the organisers, band and sound person! From Crook Morris - Well this years ceilidh went down a storm. The bar was busy, the dance floor was full, we had a good number of new people, a wide range of ages, and the band were in fine form. through the dance, before returning to play her keyboard. tenor sax, and trumpet respectively. evening when the dancers are so enthusiastic. effective small and friendly group of singers. Well done Jen and all the Revellers. The Kendal Mountain Festival held each November and based on the Brewery Arts Centre is a major event in the outdoor world. 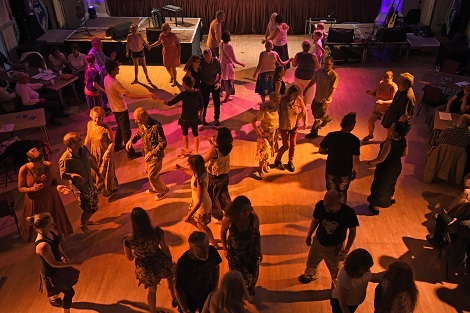 Tumbling Tom were asked to play the late night ceilidh on the Saturday night and what a great lively event it was. The band, minus Fiona, and with Dan calling. energetic dancers who were great to play for. One of the great things about playing for ceilidhs is in helping other people celebrate. This time it was to help Joyce celebrate a major birthday and her retirement. A good turn out for Joyce, and excellent enthusiasm in the dancing, helped make a very enjoyable evening. Thanks for asking us Joyce, and best wishes for your retirement. with the dance Wring out the Dish Rag. The band are busy this month rehearsing with our horn section for the annual Christmas ceilidh in December. There will be some new tunes and dances, including a dance to a triple time hornpipe, and an opening song called Turning of the Year written by Jon Harvison. 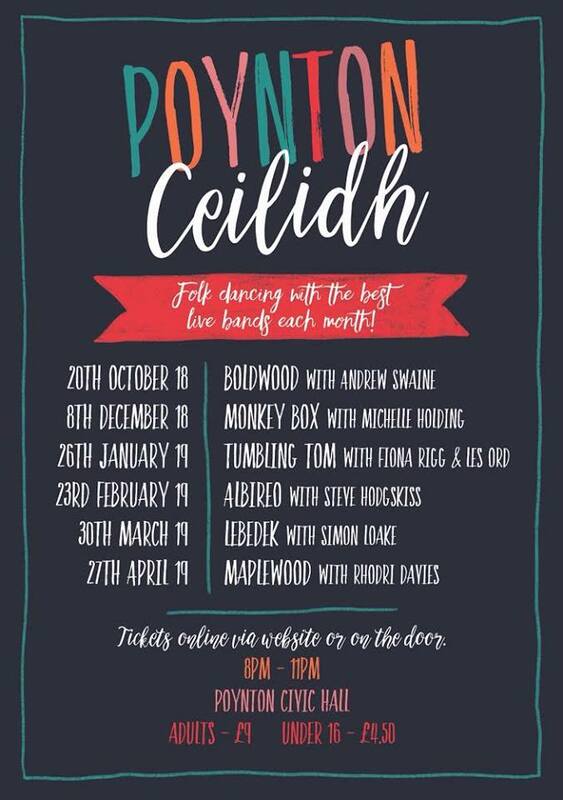 We're also starting to think about playing at the Poynton Ceilidh for which we've just received the poster below. 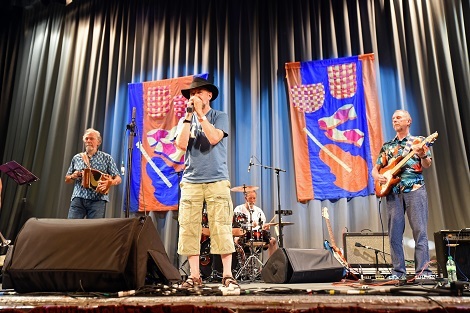 The month is traditionally a month off for the band, giving time to visit festivals and have holidays etc, and Womad, Sidmouth, Whitby, Towersy, and Shrewsbury were all visited by various members. 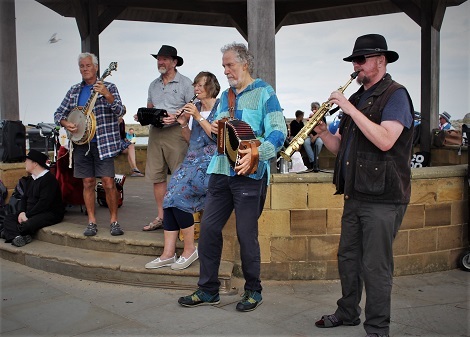 Below is a photo of Fiona and Hugh with others playing in the flash mob ceilidh at the bandstand in Whitby. 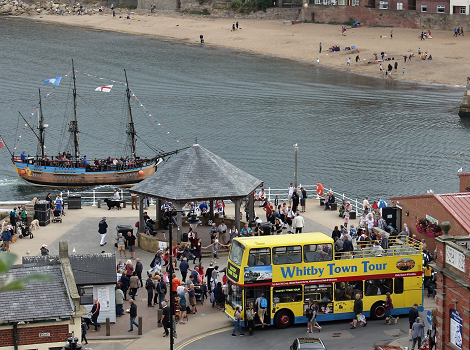 All images of the Festival are copyright Trev Eales. Early Days section of the Blog. the bands playing and Martyn's calling. across the stage at the rest of the band. full of enthusiastic dancers, so the trip down the M6 to Adlington near Chorley for the Phoenix Ceilidh's made for a great evening. Farmer for producing a great sound from the eight musicians. 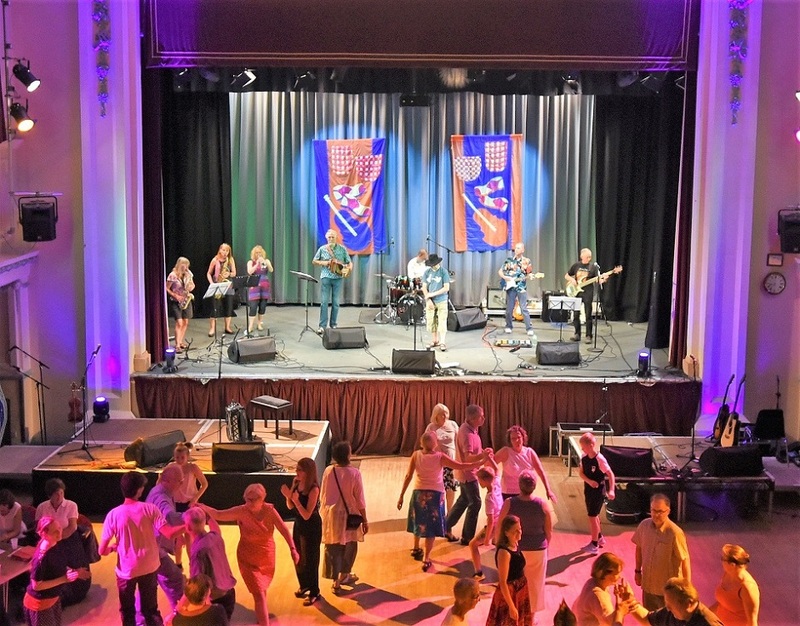 Another dancer told us Great job last Friday - we (my wife and our two friends) thoroughly enjoyed the ceilidh on Friday night. to keep the variety going. We'll ask the powers that be to book you again. Wilfs, and entertainment from the Westmorland Cloggies and Yon Lot Cloggies: what could be better! Roger said afterwards - Very many thanks to you and the band for giving us a great evening last night. The church alter which doubles as the stage for functions. the usual rectangular badminton court shaped hall. A great crowd of people, and tasty food made for a great evening. 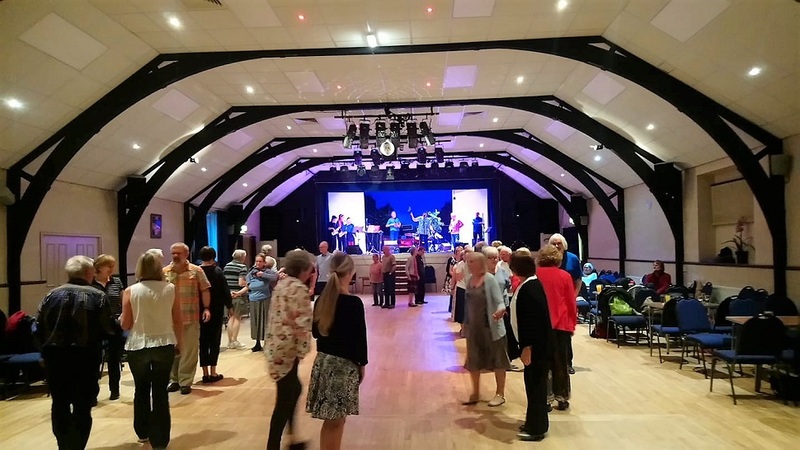 The next ceilidh in February was the following week, when we helped Roger and Cress and their friends celebrate Rogers 60th birthday. Happy birthday Roger, and we hope you get that new bike! Cress said later: Please pass on my sincere thanks to all band members for ensuring that Roger's 60th party was a great success. The only people not to dance were those with injuries!